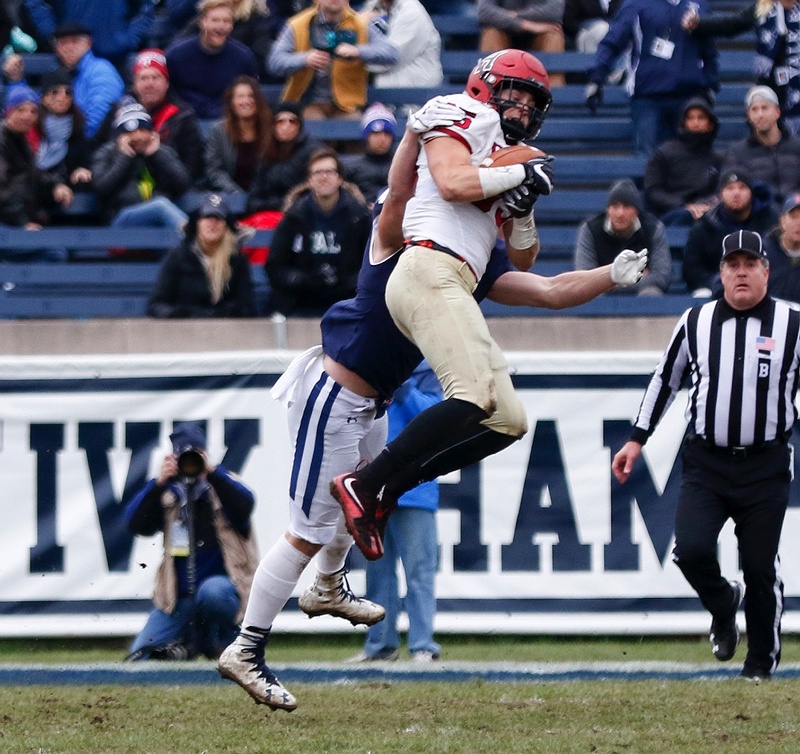 Sorry, dude: Senior linebacker Chase Guillory (45), junior linebacker Charlie Walker (41), and junior defensive lineman John Pirrmann (86) swallowed up Yale's star freshman Zane Dudek, who was held to 64 yards. Oops! Harried by Yale’s Foyesade Oluokun, freshman quarterback Jake Smith (10) and freshman running back Aaron Shampklin (20) failed to connect on this option pitch, resulting in a costly turnover. Junior wideout Justice Shelton-Mosley was on the move early, catching three passes on the Crimson’s first drive. Cool hand Luke: Senior captain and linebacker Luke Hutton helped preserve the Crimson’s early 3-0 lead with a second-quarter interception. Not our day. Not our year. 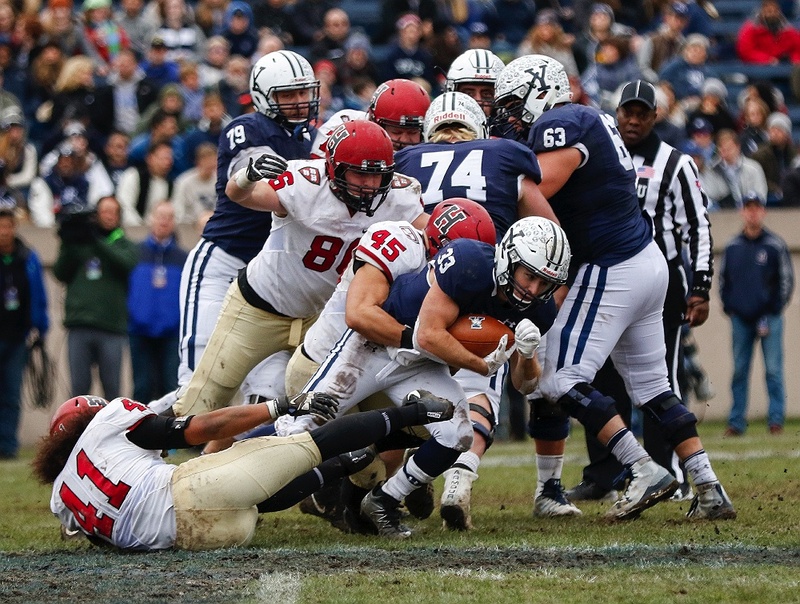 On Saturday at the Yale Bowl, Harvard went to extreme lengths to prove that you can’t win if you can’t score. In the 134th playing of The Game, the Crimson—partly undone by two slippery option pitches—were humbled by the archrival Elis 24-3. Only a staunch effort by the Harvard defense kept the margin from being greater. The loss dropped the Crimson to 3-4 in the Ivy League (see standings below) and 5-5 overall, Harvard’s worst season since 2000. The victory—Yale’s second straight in The Game—gave the Elis a 6-1 league mark and a 9-1 overall finish. The triumph also allowed the Bulldogs to hold off Dartmouth and surprising Columbia and bring to New Haven Yale’s first outright Ivy title since 1980. The Crimson did not score a touchdown in the final nine quarters of the 2017 season, the longest such stretch of futility since the season of ’86—1986—when Harvard suffered three straight shutouts. On Saturday the Elis limited the Crimson to an anemic 164 yards of total offense, and a microscopic 26 yards rushing. Harvard played without its best runner, junior Charlie Booker III, who was out with an injury. That left the Crimson without a power back to negotiate a muddy field. But really…having Booker probably wouldn’t have changed the outcome. The Crimson’s high-water mark came on their first offensive series. Freshman quarterback Jake Smith engineered an 11-play, 55-yard drive that featured three completions to star wideout Justice Shelton-Mosley, the first for 21 yards, the second for nine and the third for 18. (Shelton-Mosley finished with a game-high seven grabs, for 77 yards.) This seemed like a plan, especially in the absence of Booker. But as so often happened late in the season, the drive bogged down in the shadow of the opponent’s goal. So sophomore Jake McIntyre came in and drilled a 29-yard field goal. Harvard 3, Yale 0. A punting battle ensued between Harvard senior Zach Schmid and Yale’s Alex Galland. 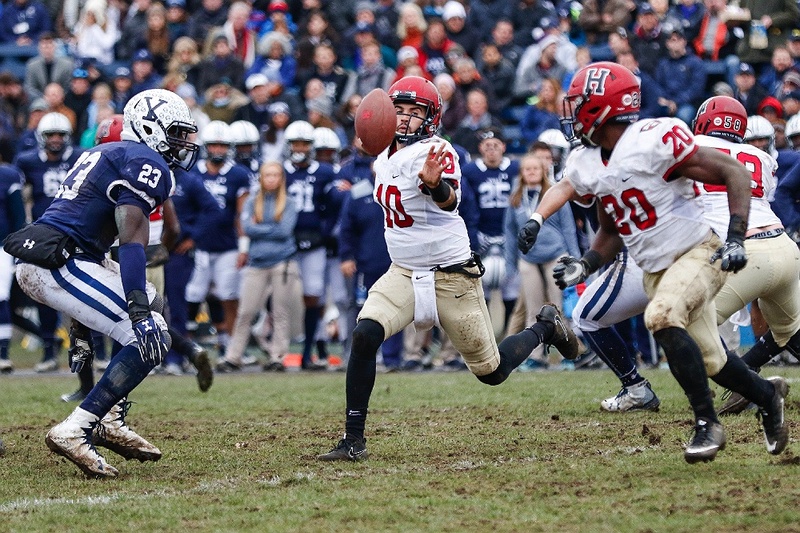 Until the middle of the second quarter the Crimson defense held off the Elis, with senior linebacker and captain Luke Hutton halting one drive by intercepting Yale quarterback Kurt Rawlings. But in the middle of the quarter, Rawlings completed a 46-yard strike to wideout JP Shohfi, who reached the Harvard eight. On the next two plays the defense stopped Yale’s star freshman runner Zane Dudek in his tracks. (Dudek would finish with 64 yards on 25 carries.) But on third down Rawlings lobbed a beauty to Shohfi in the end zone. Galland kicked the extra point. Yale 7, Harvard 3. Then came the sequence that defined the game. When Harvard got the ball back, Smith was sacked on first down. On second down, he tried to run the option. He made a few yards—but when confronted by the Bulldogs’ Jason Alessi, he tried to get more, attempting a pitch to his trailer, freshman back Aaron Shampklin. Instead, Smith threw it behind Shampklin. The ball became free and was picked up by Yale’s Malcolm Dixon on the 19. Dixon ran it into the end zone. Galland again kicked. Yale 14, Harvard 3. Two touchdowns in 55 seconds. On the next series, at the Harvard 38, Smith and Shampklin failed to connect on yet another pitch and again Yale recovered. Rawlings and Yale held the ball for 11 plays, and this time the Crimson defense did well to keep the Bulldogs out of the end zone. On the final play of the half, Galland booted a 25-yard field goal. Yale 17, Harvard 3. The second half featured more exchanges of punts (there were 16 in the game) that availed the trailing Crimson not at all. Finally, at the beginning of the fourth quarter, the Elis administered the coup de grâce. On third and 13 at the Yale 37, Rawlings found wideout Michael Siragusa Jr. for a backbreaking 24-yard gain. On the next play running back Melvin Rouse II (like Dudek, a freshman) sped 25 yards to the Harvard 14; on the following play, Rouse crashed 11 yards to the three. Two plays later Dudek scored. Galland punctuated. Yale 24, Harvard 3. 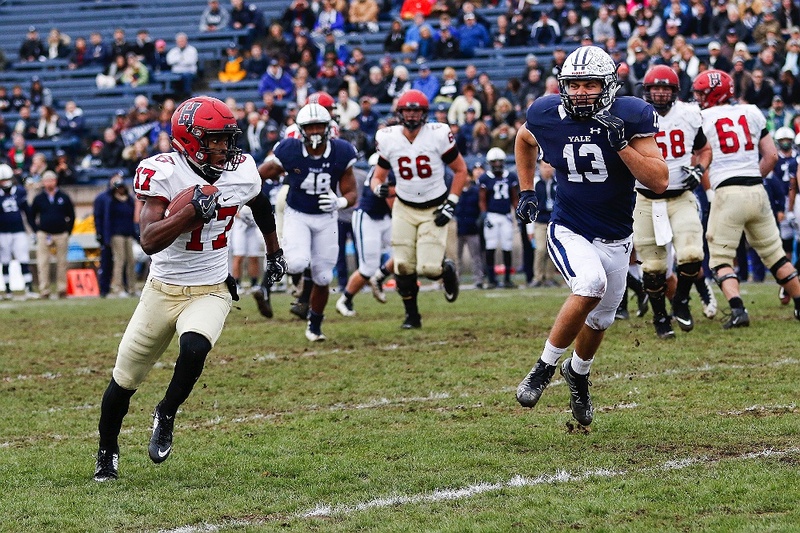 A valiant Crimson defensive effort had been wasted; the Bulldogs, who came in averaging 463.0 yards of total offense in Ivy games, had been held to 295. The momentum of The Game, for nine years in Harvard’s favor, has now swung. Likewise, after having dominated the league for so long, the Crimson is 3-6 in its last nine conference games, and the overall victory total has fallen in successive years from 10 to nine to seven to five. It is incumbent to turn it around in 2018, especially because it will be Shelton-Mosley’s final season in Cambridge.